These wall-mounted sconces—each home to an air plant—are handmade with local wood, clay, and glazes. Maker Anna VonRosenstiel's signature wall-mounted planters are handmade with care. Crafted from skillfully worked slabs of Oregon clay, each cone-shaped sconce is attached to a piece of local lumber, sanded and finished to perfection by hand. Topped off with a roofing nail—a nod to Anna's father, a builder—each comes complete with a low-maintenance air plant nestled cozily inside, so you can add a touch of green to your home with minimal effort. Due to Mother Nature's whims, each air plant is unique and will vary. Handmade in Oregon. Keep your air plants thriving with our Nourishing Air Plant Spray. Water air plants weekly. Rinse or soak, shake excess water out, let drain and dry. Once the plant is dry, put back into the wall planter. Each sconce has a saw tooth hanger attached for easy wall display. 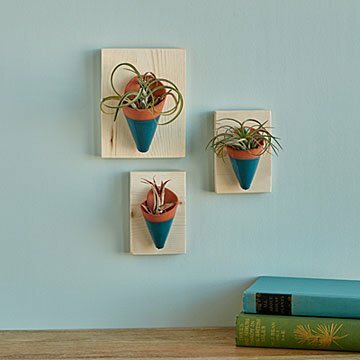 Due to Mother Nature's whims, each air plant is unique and will vary.